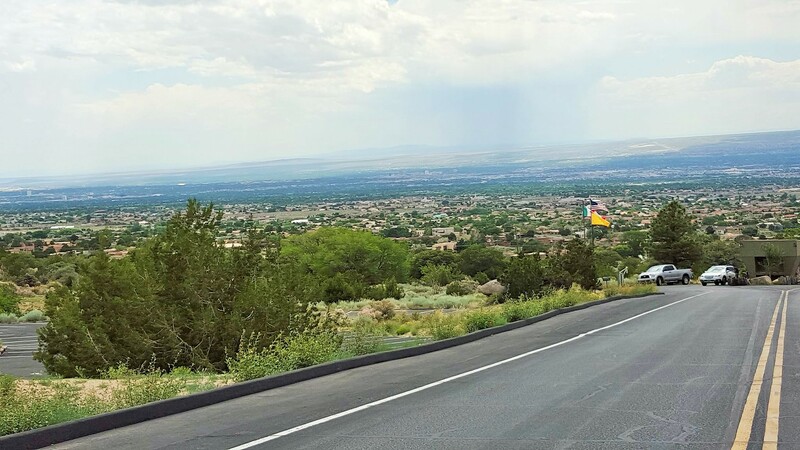 On the Way to Albuquerque, New Mexico – …………. 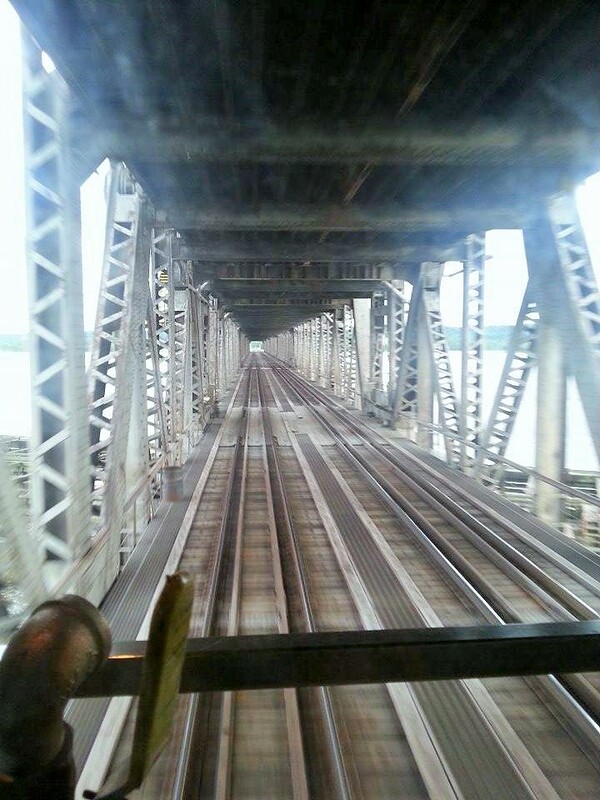 ''AND LET THE FUN BEGIN''……………..
Gino and I boarded the train at Princeton. When I decided to go, I checked tickets and the Value ticket from Princeton was not available, but it was from Mendota, which was the stop before. I of course bought it from Mendota, lol. I thought about calling Amtrak, but never did. What could they do? My ticket was paid and they just got a little more of my money. When the conductor came around to check tickets, she checked Gino’s and then looked at me. I was looking for my ticket, and she said “I bet your ticket is going to say to board at Mendota isn’t it”. lol I looked at her with a smile and said, ……”Yeeeesss”……She said she knew when she seen 2 of us coming to board, she should have only had 1, and she was short in Mendota…..She was smiling, so she was ok with it, but I guess they really do keep track…. 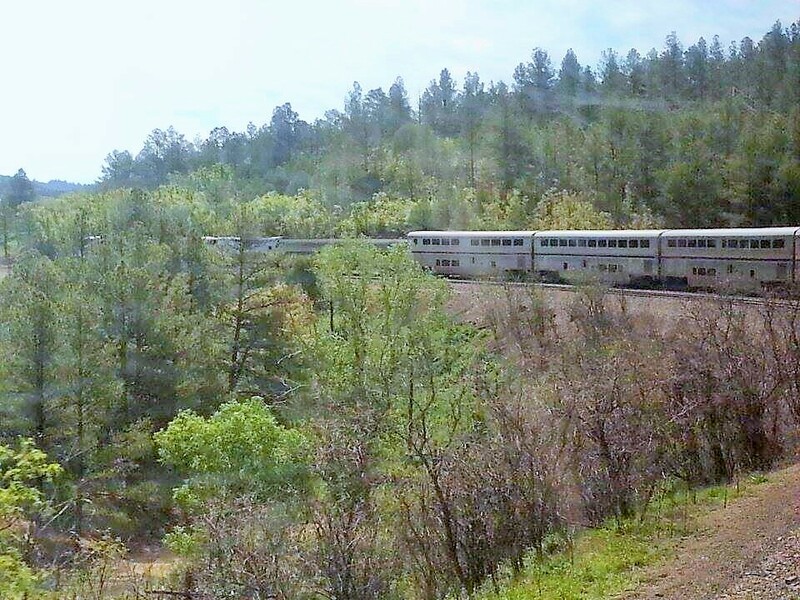 Ive’ always loved train travel, as Rich and I have rode many times. Ahead of us was a younger girl….(20’s). She had on her headphones, and kept singing and dancing in her seat….How annoying….Gino kept mumbling things everytime she would get loud (he had a few beers already)….I was annoyed with her, but a little worried he would be heard and oh NO………….But fortunately, she got off at Kansas City. We were in the last car which was a first for me. We were able to see out the back door. We seen some water in the fields, but not as bad as I thought it might be, with all the rain we’ve had. .
We crossed over the Mighty Mississippi, at Ft. Madison Ia…..what a beautiful river, and so vast and really calm….. So much beautiful scenery coming down in to New Mexico. The train has to slow way down and go slow through the curves…(thank goodness)….The track in one place switches back and forth as it comes down the incline of the mountain….We went through a tunnel and in many places, the hills had been blasted large enough for the train to fit through. The next day we went and visited her for a short time and made plans for Monday with her. Yesterday I took Gino’s car and went visiting. First stop, my ex niece in law…..lol….Lisa was married to my sister Anna’s son, Bill. Now she lives across town with her sister and one of the daughters, Lee Anna and her little girl Melissa. She is only 3 and is so tiny and cute. Had a FABULOUS visit with Lisa….We talked about our kids, and told many storys of the past…..Had some great laughs with the memories from the past. So enjoyed our visit. Finally I left and was to head to my friend who I graduated with, Randy and his lovely wife Sharon. We attended the same school most of our childhood life, and even graduated in the same class…..The whole 36 of us…..lol….. and had never seen each other again till last year. He came to Illinois to visit family. We had found each other on fb several years ago and was astonished as he had settled in Albuquerque. 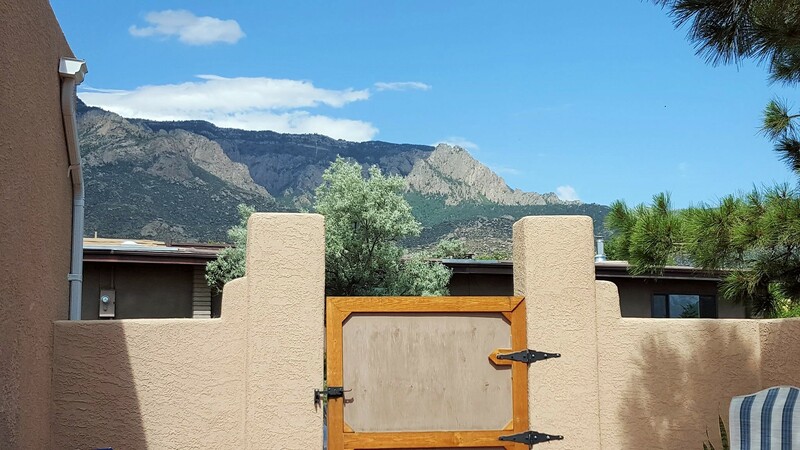 He was living on the east side in the foothills of Sandia Mountains, near the Tramway. Being I was early, I decided to buzz up to the Tram way……I’ve been their many times before…The clouds were coming and going….some rain…some sun….. The Sandia Peak Tramway consists of 2 cable cars that are suspended with only 2 towers between the 2 terminals. From bottom to top, it is 2.7 miles long and takes 15 minutes to ascend 4000 ft. Each tramcar is capable of carrying 50 passengers or 10,000 pounds up the mountain at a maximum rate of 200 passengers per hour On the average, the tram makes 10,500 trips per year. On the top is a beautiful Restaurant and miles and miles of hiking trails…..A ski slope goes down the other side of the mountain. The Tramway is now 48 years old. It was rather cloudy and sprinkled a little while I was their. 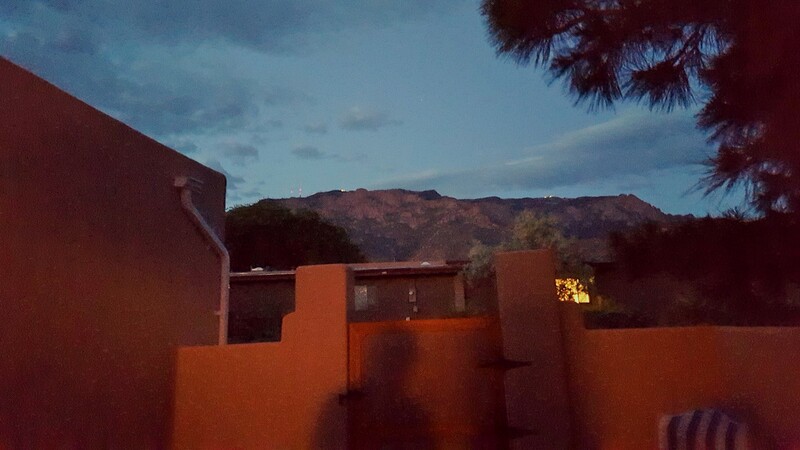 As I was leaving, I looked out and seen Albuquerque. 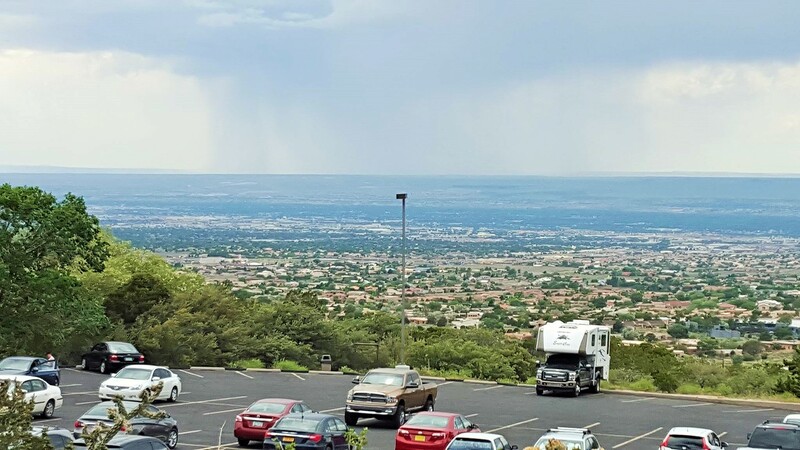 What a beautiful site to see the city nestled down in the valley….Their were some storm clouds and you could see the rain coming. So on down the road to Randy and Sharon’s. It wasn’t far at all. I was amazed as to how close they lived. Their view from there courtyard was beautiful. As we sat their and visited, one just couldn’t take your eyes away from the amazing site before you. We had such a nice visit, remembering old times, and catching up from the past. Finally we went to dinner, to a really cool Mexican Restaurant. It was decorated true to the Mexican culture. Of course leftovers were taken home……Back to their house for more visiting. Before we knew it, it was time to go…….We went out the court yard, and right before my eyes was the breath taking view of the mountains at dusk. 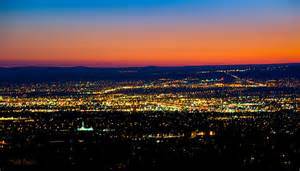 …………..Driving down into the valley of “Albuquerque” at night…………..